Yesterday we told you about Tobias Leingruber’s Facebook ID card, which is exactly what it says on the label – an ID card with your Facebook information. Whether a novelty or a hint of what the future might hold – the idea certainly caught people’s attention. While Moo was first to the idea, it took more of a business card approach. Leingruber, on the other hand, compares his Facebook identity card to passports or national IDs. 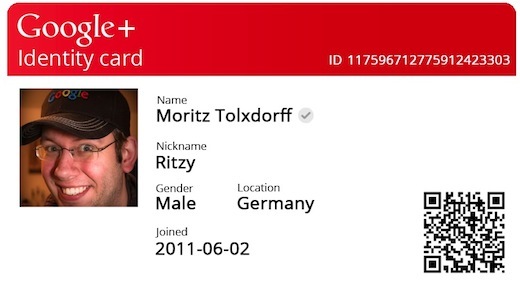 Now, following suit down to the promotional image of the ID cards, IT engineer Moritz Tolxdorff announced a similar concept for Google+ users. The post got about 70 comments, and that was all that was needed for Mortiz to set up a service where users can generate ID cards of their own. If you want a Google+ ID card, all you have to do is enter your profile ID number, a nickname, and the date you joined, and the site will do the rest, getting your location, and gender from your Google+ profile, if available. Your ID card will be downloaded to your computer, as a PNG file, complete with a QR code that links to your profile. As Drew mentioned yesterday, we’re nowhere that point in time where Facebook or Google+ ID cards are anything more than a novelty. But while that’s all they are now, there may come a time when flashing your Facebook or Google+ ID card at the airport is a daily occurrence. After all, if someone had asked you 10 years ago if you were willing to place pretty much all the information pertaining to your personal life online – from photos and thoughts, information on who’s related to you and how, where you’ve lived, and pretty much every little bit of biographical information you want to share with your friends – you might have thought that sounded crazy. So who knows. A few years from now, this might not seem like such a crazy idea. For now, all that’s missing is a Twitter version of these ID cards, and we can officially call it a day.